Ayyappa Sabarimala Online Darshan tickets booking 2018 - 19 started from 30th October 2018. Ayyapa devotes can book online virtual queue tickets from online free of cost. But from this year you need to buy bus ticket from nilikkal to pamba without this ksrtc bus tickets your virtual ticket is invalid. So who are booked their virtual Q darshan tickets they need to buy bus tickets too. This is very important thing so please don't forget this Devotes you can book online darshan tickets 2018- 2019 at official online booking website. For sabarimala booking online darshan tickets 2018 you need Id Proof & Address Proof Example: (Pan card, Voter card, Aaadhar card, Ration Card etc..) & your color photo less than 30kb file for uploading. Kerala police was checking with Bar code scanners at pampa so this online darshan ticket is not transferable so don’t forget this. sabarimala online darshan official booking website (sabarimalaq.com) are maintained under Kerala state police. Rooms Accommodation booking details are available in our website (Help line contact numbers). How to book sabarimala online darshan booking 2019? This is very simple process just follow these instructions. 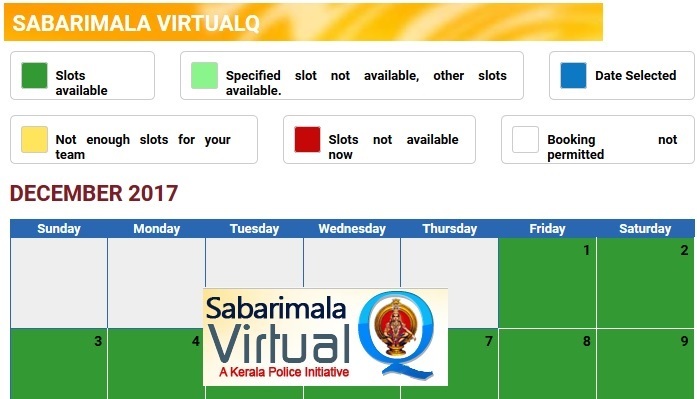 Sabarimala queue booking online 2018 started for November, December, January 2019. Sabarimala Ayyappa Swamy temple is one of the famous and oldest Temple in Southern India and it will be open in some specific days throughout the year. Sabarimala Ayyappa Temple Dharshan will be started soon. Room bookings for the year 2018-2019 is started from September 2nd or 3rd week 2018. Swamy Ayyapa devotes can book rooms for accommodation in online (www.onlinetdb.com). The room bookings will be available from September 2018 to January 2019 for Ayyappa Devotees along with this pilgrims can book Dhrashan tickets in online. In Sabarimala Travancore Devashom Board, Kerala Temples Board facilitated many choultries for Accommodation. For rooms or Dharshan tickeks Devotees need to register in official link as a pilgrimages or as a Donor. How to Register in Online for Room Accommodation in Sabarimala? For room accommodation and darshan tickets first of all register all the details in online and then you will get a User name and Password. Pilgrims who already registered can open the link with User name and Password and then book the tickets for darshan and rooms. For new registration go through the below steps. Search for Room accommodation or Dharshan Tickets. For Room booking the rooms, room status will be shown in 3 colours for identification to know the dates room available. If the color is green Slots are available Red color indicates online darshan slot are not available Hit on the Date in the calendar For booking available slots Hit On book now Button. Enter the devotees information and then search for rooms there will be so many guest houses, cottages are there for pilgrims in Sabarimala. Pilgrims need to show id proof and need to submit a Xerox copy of id proof at office. NOTE: Sabarimala Room Accommodation will be provided for only 12 hours at sabarimala shrine as there were less number of rooms available. ID proof and name on reservation slip is compulsory. Rooms will be available in online before 30 days prior to each day released. Time of release of rooms was 12:00Am morning. Travancore devashom board started online booking facility for devotees to book for Dhrashanam, Pooja, Prasadam etc. the complete services regarding the Sabarimala temple will be available in online. Go through online official link and check all the calendar and all about temple and then book slots. The booking will be available at before beginning of Temple dharshan. Only once a month Poojas are performed, Other times temple premises remains isolated. The pilgrimage to the sacred shrine of Sabarimala. In the olden times Sabarimala was located in the very deep forests .The Dark green Forest was filled with ferocious wild animals like tigers ,area was inaccessible with adventures& risk full routes ,therefore only a few prayful courageous devotees managed the difficult pilgrimage. The online services will be available for Room Booking, Pooja, Prasadam, Book, Pass, Kanikka, Annadanam etc. The complete list of pooja services available at Sabarimala ayyappa swamy temple is given below. Devotees have a facility to give donation for sabarimala ayyappa swamy temple through E-Kannika. The most important pooja and offering performed at Malikapuram is Bhagavathi seva. How to Book in online for Sabarimala Ayyappa swamy Pooja, Abhishekam, Seva, Prasadam Tickets in Online? Open the link https://www.onlinetdb.com and then go through online services. Select the service which you want to book there will be all services available in online and then pay the amount for the services and book your slot. Prasadam there will be 2 types big and small pack book the slot whichever you want and they will be give token. Sabarimala temple opening dates 2018 to 2019: The Sabarimala Ayyappa Temple in Kerala is open for darshan only during certain specific periods in a year. Sabarimala temple usually opens at 04.00am and closes at 11.00pm. During the peak seasons like Makaravilakku Mahotsavam, the timings might altered to accommodate the large number of devotees. Based on Malayalam calendar the temple will be open in first 5 days of every month in a year and in some other days the temple will be open in some special days like Sabarimala Shrine festival, Vishu, Ayyappa Idol installation anniversary puja, Onam puja, Sri Chitira Attam Thirunnal, two months during the Mandalam Pooja season (November – December) and finally during the Makaravilakku Puja (January) season. Every year Malayalies will celebrate their Kerala state festival Onam in the month of September on that day onwards the temple will be opened. From that month onwards large number of ayyappa devotees throughout the country from all states wear ayyappa mala dharana and they will do deeksha for 41 days on the next day they visit ayyappa temple in sabarimala with irumudi and there ends the deeksha. In Mala Dharana there will be 18 holy steps. During in the month of January Makaravilakku pooja will be done on the next day the temple will be closed. So it is best time to visit the temple during this period. Every year Malayalies state festival Onam the temple will be open. The festival will be celebrated in the month of September. This year Onam festival celebrations will be start from 12th September to 17th September in these days Kanni pooja or start of Mandala pooja is observed after this month. Kanni pooja in Sabarimala is done from 16th September to 21st September. Ayyapa Monthly pooja will be done every month it will be called as Thulam Monthly pooja, Sree Chitra atta Thirunal in sabarimala. The temple will be open at 5:00 am and it will closes at 11:00 pm on special days. Mandal pooja or Mahotsavam is observed in the month of November. Mandala pooja will do 41 days. From 30th December 2017 (30.12.2017) to 20th January 2018 day (20.01.2018) Thirunada is considered. Temple closes its door finally on makaravilakku day. Day for makara jyohti or jyothi darshan is 14th january 2018. On this day throughout country celebrate Makara Sankranti. How to book accommodation in sabarimala online? 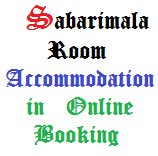 for sabarimala accommodation online booking you need to Account on official website. Enter your correct details in sign up form after submitting. from Accommodation booking website you will get Conformation link to you Em@il Address. In the welcome Home page "Room Reservation" link is available hit on it. Select "General" option check for room availability on room reservation website. you can pay sabarimala online room booking Reservation amount 1) DD 2) Bank Challan 3) NEFT. Sabarimala darshan online darshan tickets booking registration 2015 - 2016 was started now for Nov 2015 & December 2015 Slots From morning 4am to Evening 8pm So who are going to sabarimala ayyapa swamy temple those all candidates can book and advance registrar their online darshan tickets for free of cost at sabarimala travancore police official tickets booking webhomepage .sabarimalaq.com. we updated full details about how to book sabarimala online darshan booking 2015 and sabarimala temple opening dates 2015 - 2016. so don't worry about this. How to Book Sabarimala Temple Darshan Tickets Online 2016? Don't worry swamy we will help you to how to book online darshan tickets with five minutes for free of cost at official sabarimala online registration kerala police 2015 - 2016 website. Just follow these simple steps for getting ticket with in minutes. 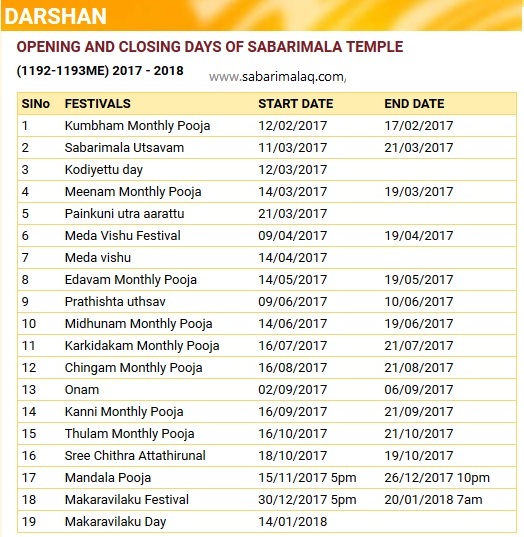 We will update sabarimala temple opening dates 2015 - 2016 also on www.sabrimalaonline.in website. You can check ayyapa swamy temple opening dates 2016 for free in sabarimalaonline.in web portal.